Sensis Plus Superior White Wine Glasses. Pricing is for a set of 2 glasses. It is recommended that you use the same size, shape and model of Eisch glass for this comparison: one the "standard" glass, the other "Breathable". Use a glass from another manufacturer that is as close in shape, size and volume to the "Breathable glass". Note: The glasses should be cleaned the same way; by hand and rinsed in clean warm water. The comparison works best when the bottle is opened right before tasting. Pour the same quantity of wine in both the glasses, wait between two to four minutes. Then taste the two. First, smell the aromas of each. Immediately, small differences should be noticeable. Then, take a sip from one glass and evaluate it, followed by the other glass. Repeat the process (smell, then sip) again. The affects of the "Breathable Glass" are most evident with young red wines and white wines; those which typically benefit from at least 30 minutes of aeration before being consumed. The impact is so dramatic with high quality wines, not inexpensive jug or box wines. Is the decanting carafe a thing of the past now? No, not necessarily... When you have time, it is nice to slow down and spend some quality time with friends and family. When you are not on a hurry, why not show off your lovely decanter, and celebrate. Of course, one should also know that there is no negative effect on already perfectly prepared wine if it is enjoyed from a Breathable Glass. And - still very important - a crystal decanter almost always meets certain aesthetic requirement. It will 100% make a table setting more elegant, without a doubt. In today's hectic world, the Sensis glass allows you to open a bottle and serve the wine immediately - Enjoy the wine in a Breathable Glass. Does the BREATHABLE GLASS only improve wine, or also other drinks? With the Breathable Glass a distinct improvement can be achieved with most wines, but it depends on each individual case how strong this improving effect will be. Decanting also does not lead to an improvement in every case! The Breathable Glass, however, will not turn a bad wine into a good one! On the contrary, care must be taken when a wine is bad, since the Breathable Glass is reliable in its design. Any standing flaws in the wine, such as corkage, will also be intensified by the Breathable Glass. In addition to wine, Breathable Glasses can also lead to improvements with spirits, fruit juices, and mineral water. Does Breathable Glass change the chemistry of wine? There is no change at all in the wine, for example ionization or a change of the pH-value. Only the natural decanting process is accelerated. How are BREATHABLE GLASSES identified? Does Breathable Glass require special care? The Breathable Glass effect is permanent. It should be treated just like any other high-quality crystal glass. Special care is not suggested specifically. 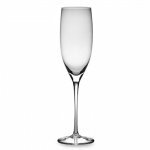 Wine glass research has primarily concentrated goblet shape to optimally bring out the nuances of various wines. 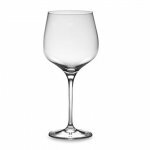 This discovery and evolution of glassware has provided today's wine connoisseur with a great variety of different goblet shapes and sizes for enjoying a variety of exquisite wines. The result of this research led to a new revolution in the wine glass technology with a new generation of goblets, the "Breathable Glass" - i.e. glasses that "breathe". These glasses are made from a special raw material mixture, the so-called batch, in lead-free crystal quality. After the actual manufacturing process, the glasses undergo a proprietary oxygenation treatment, which gives the Breathable Glass its unique properties. Many wines need to be in contact with the air in order to maximize the development of their bouquet and aromas. This is why wine is usually opened 1-2 hours before drinking, and is decanted in a special carafe. Many a time, however, these 1-2 hours are not available, because who does always know whether he wants to drink a glass of wine in 2 hours, and if so, which one? In a restaurant, the ordered wine has to be served within only a few minutes, and also at home the small glass of wine cannot necessarily be planned hours in advance. This is exactly where the Breathable Glass comes into play; to develop the aromas and bouquet of the wine, you only need 2 to 4 minutes in a Breathable Glass. With a Breathable Glass, your wine reaches its optimal almost immediately after it is poured. This effect is completely natural - it simply accelerates the reaction of the wine with the atmospheric oxygen that takes place anyway. The original character of the wine and its structure are maintained, while the wine opens up and gains taste and volume.
" Even a bit of vigorous swirling with the traditional glass didn't close the flavour gap." " The sensation of the season? The Eisch Breathable Glass from Germany. Just pour your big, tannic, puckery wine in the glass and within seconds, the fierce tannins are tamed. I have tested it a dozen times, with very young heavily oaked reds from Australia, France and California. Test it yourself, pour a bitter red in a normal glass, then in the matching size crystal glass. You will be amazed." 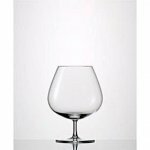 " Eisch breathable wine glasses. I've been using these babies for the past couple of months, and you know what? I haven't used my plain ol' crystal since these showed up in my house. I poured a cheap red into a plain crystal glass and into an Eisch breathable glass, then offered both to my husband. He took a couple of sniffs, then asked why I'd opened two bottles. He didn't even believe I'd poured him the same wine. Seriously. The company also offers breathable espresso cups, designed to take the bitter edge (not the caffeine) off your morning java shot. Sign me up for more, more, more. (Brandy snifters, perhaps?)" 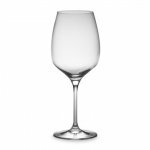 " The Eisch Breathable glasses works amazingly well"
"What a difference a good wine glass makes." "An impressive demonstration of how a fine glass improves a wine." " You almost don't want to believe it could work, but I do notice a difference"
"Aromatically, there's more there with the breathable glass" said Geoff Last. "The breathable glass was more aromatic and showing more fruits. The tannins were still very much there but were considerably softer in the breathable glass." " Pouring young red wine from Niagara into a "breathable" glass and a traditional glass with a similar shape that was produced by the same manufacturer. Twelve colleagues were asked to try the wine and tell me what they thought. An overwhelming majority (10 out of 12) stated that the breathable glass had more intense aromas and a wider range of aromatics. One taster found no discernible difference; another liked the sample in the traditional glass because it was less aromatic. Call it the ideal gift for the wine lover who has everything - except time to leisurely decant their wine." Hey, am I crazy or did that glass just breathe?
" I was dubious about the breathability of this glass, mainly because it looks, sounds and feels like plain old glass to me. But when I poured, at the same moment, cabernet into my old favorite glass and this new glass, then thoughtfully sipped side-by-side five minutes later, I was shocked. The wine from the Eisch glass was completely different, sporting smoother tannins that made the wine seem more lush, even sweet. The difference was so marked that I'm not sure those who made the wine would approve. But for young wines that you don't feel like decanting, this is the glass you want." " We approached the newly arrived Eisch Breathable Glass with at least a little skepticism, as we prepared to blind taste a number of wines to see how they'd evolve when poured side by side in the Breathable and conventional glass (made also by Eisch) of almost precisely the same shape and size. The degree to which wines reacted varied. But, interestingly enough, there was almost always a discernible difference. Vins et Vignobles - Nicole Barette-Ryan. There is nothing in the appearance of the Breathable Glass that makes it different from others. It is made from very fine lead-free crystal that has been subjected to a totally unique oxygen treatment that allows it to accelerate the opening up of the wine - a process that normally takes several hours after pouring into a traditional decanter. We made several tests with different wines - whites, roses, reds (young and old) tannic and very woody. I don't know how to explain it, but all the wines, tasted side by side - one in the Breathable Glass and one in a similar glass from another supplier - showed themselves to better advantage in the Breathable Glass, more open, more together, fuller and more complex. Young red wines, white wines and rose wines in the Breathable Glass had great exuberance and showed more expansive fruit. Acidity, often too much in evidence in these wines, was harnessed to the fruit and lost its aggressiveness and in doing so lifted the fruit. All these qualities are apparent as soon as the wines are nosed. The difference is immediately apparent. On the palate, all the wines presented a "togetherness" with no bitterness, in a real cocktail of flavours. Being a skeptic, I contacted the importer and he was kind enough to send me a Breathable Glass and also a normal glass for control purposes, identical in every respect but non-Breathable. I prepared the experiment according to the most rigorous scientific standards - "double blind with placebo". For this, I asked my wife to mark the glasses without letting me know what she had done. Then I chose a quite robust red wine that I poured into the two glasses. After four minutes, the results were unequivocal. The nose of the wine in glass A (the Breathable Glass) was more developed and more complex. On the palate, it was finer and softer. I would be curious to know the technique used in the manufacture of this glass. It is most surely a secret. 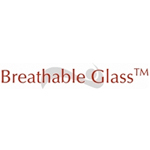 Breathable Glasses are available for shipping throughout the USA and Canada.